Although I gave him a good grade for his first 100 days, it’s no secret that I’m not overly optimistic about the long-term policy implications of the Trump presidency. 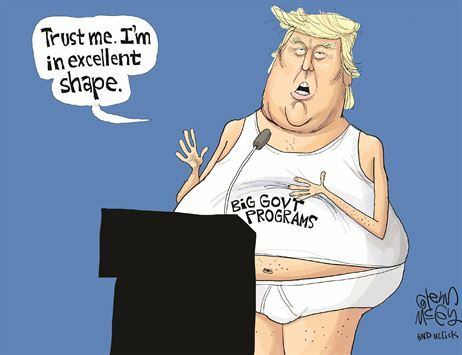 Simply stated, I fear he’ll wind up being a big-government Republican like Bush (either one) or Nixon rather than a small-government Republican like Reagan or Coolidge. I’ve specifically complained about Trump’s approach to entitlements, his support for protectionism, his proposed childcare subsidies, and that’s just a partial list of his statist policies. I mention all these things because I’m about to defend the President’s extended family for the practice of “selling” American citizenship and I don’t want anyone to accuse me of being a shill for Trump. You will get a good grasp of the controversy if you read this editorial in the New York Times. Here are the key passages. The Kushner family…has been highlighting its White House connections to entice wealthy Chinese investors and promising them green cards in return under a special government visa program. …it’s also a scandal that Congress allows real estate developers to use the American immigration system to pad their profits. …Jared Kushner, President Trump’s son-in-law and special adviser…. His sister Nicole Meyer was in Beijing and Shanghai this past weekend seeking investors for a luxury apartment project her family is developing… Her sales pitch cited her brother and laid out how a $500,000 investment could provide a coveted path to American citizenship. …Ms. Meyer’s disturbing investor pitch was made possible by the EB-5 investor visa, which opens an express lane into the United States for those who can afford to invest nearly 10 times what the median American household earns in a year. …Under the program, investors have to put at least $1 million, and it has to lead to creation or preservation of at least 10 permanent, full-time jobs. But the minimum investment drops to $500,000 if applicants invest in rural areas or places with elevated unemployment. I don’t agree with the tone, but this is an accurate description of the program. The EB-5 program is a part of America’s immigration system and it is explicitly designed to lure job-creating investment to the U.S. economy. Yes, it’s poorly designed and presumably should be improved. But the underlying concept is good. If we want more prosperity, America should join in the competition to attract economically successful migrants. After all, many immigrant groups are unambiguously good for the American economy, increasing our per-capita GDP. The EB-5 program creates a pathway for those people, and the Kushner family is simply showing them that investing in commercial real estate is one of their options. I don’t understand why some people think this is a bad thing. All things being equal, I’d rather have rich immigrants than poor immigrants. That’s why I defended Governor Scott Walker when he was attacked for wanting some of these people investing in Wisconsin. And that’s why today I’m defending the Kushners. I want America to become more prosperous. Yet this rational policy rubs a lot of people the wrong way. Including some lawmakers. Senators Grassley (R-IA) and Feinstein (D-CA), the Chair and Ranking Committee members of the Senate Judiciary Committee introduced bill S. 232 to terminate the EB-5 Visa Program. Critics tend to make three arguments. They don’t like rich people benefiting – My response is that don’t care that wealthy foreigners benefit or that wealthy American developers benefit. My goal is more growth for ordinary people, and that’s what we get with rich and/or high-skilled immigrants. They are upset about favoritism – I agree that the current EB-5 system is too complicated and vulnerable to cronyism, but the solution is to copy the nations cited below by creating very simple rules allowing rich foreigners to move to America and make investments. They worry about bad people getting visas – There already are fairly onerous rules designed to prevent crooks, terrorists, and other bad guys from sneaking into the U.S. by obtaining an EB-5 visa. There’s no evidence that the current system is inadequate. To elaborate, let’s focus on the first argument dealing with economic benefits. There is considerable research showing that ordinary people benefit when high-skilled and/or high-net-worth individuals can migrate to their nations. Here are some excerpts from a recent study by the World Bank. The number of migrants with a tertiary degree rose nearly 130 percent from 1990 to 2010… A pattern is emerging in which these high‐skilled migrants are departing from a broader range of countries and heading to a narrower range of countries—in particular, the United States, the United Kingdom, Canada, and Australia. …For recipient countries, high‐skilled immigration is often linked to clusters of technology and knowledge production that are certainly important for local economies and are plausibly important at the national level. More than half of the high‐ skilled technology workers and entrepreneurs in Silicon Valley are foreign‐born. For native workers, high‐skilled immigration means…a chance to benefit from the complementarities and agglomeration effects created by talent clusters. And here are some additional finding from the same authors in research published by the Bank of Finland. …many countries are launching new policies to attract high-skilled migrants. Examples include the United Kingdom’s introduction of a points-based immigration system under Tony Blair’s government and its recent programs to attract the “brightest and best” innovators and entrepreneurs. The Netherlands introduced a new “Expatcenter Procedure,” which is an entry procedure designed for “knowledge migrants.” Competing programs pop up with regular frequency—in short, the doors seem to be opening ever wider for high-skilled migrants…the four Anglo-Saxon countries that attract the highest proportions of high-skilled migrants—Canada, the United Kingdom, Australia and New Zealand—implement points-based systems to varying degrees… high-skilled migrants boost innovation and productivity outcomes. …longer time horizons tend to show greater gains. Here’s a map from the study. Last but not least, let’s look at two small nations that have reaped big benefits from their economic citizenship programs. Starting with Cyprus, as reported by Bloomberg. …foreigners can become citizens in less than six months in exchange for investing at least 2 million euros ($2.2 million) in Cyprus property or 2.5 million euros in government bonds or companies. Since then, the nation has issued about 2,000 passports, Finance Minister Harris Georgiades said in an interview in Nicosia last month. About half have gone to Russians, according to PricewaterhouseCoopers and other consultants who guide clients through the process. The impact has been profound, sparking about 4 billion euros of foreign investment last year — equivalent to almost a quarter of the island’s annual economic output. And also in Malta, according to Politico. 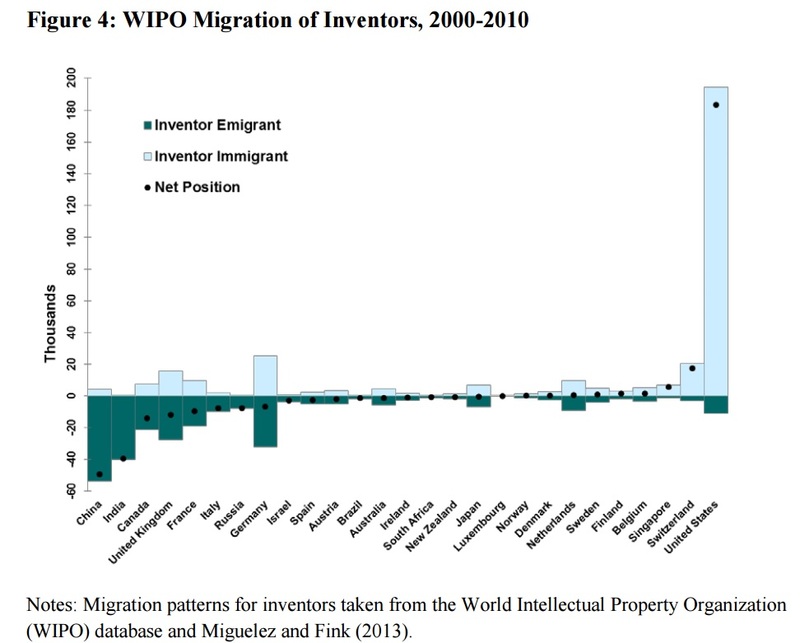 One final point, as seen in data on top inventors and entrepreneurs, is that super-skilled people want to migrate to places with good tax policy. P.S. Here’s another pro-immigration policy that would have universal support in a sensible world. Advocates of limited government favor a small public sector because more resources in the productive sector of the economy translates into faster growth, more job creation, and higher living standards. Statists, by contrast, favor big government for two main reasons. First, many of them belong to well-connected interest groups that have their snouts in the federal trough. Second, some of them sincerely think government spending “stimulates” an economy and/or “helps” people. I want to address the latter group of statists, most of whom are well meaning. I’ve learned over time that such voters generally don’t pay that much attention to economic arguments. Yet many of those voters (perhaps even including some of the ones that recognize that DC is riddled with waste, fraud, and abuse) can be persuaded to support bigger government. Having engaged in thousands of conversations with such people over several decades, I think they’re motivated by a desire to be part of a society that “cares.” So, regardless of Washington’s track record of exacerbating problems rather than solving them, these folks sometimes think more government is the right approach. Like second weddings, this is a triumph of hope over experience. Today, at the risk of jumbling my analogies, let’s try to convince such people that you don’t want a second wedding if it means you’re getting hitched to an institution that is unavoidably wasteful and incompetent. And we have some fresh eye-popping evidence. Here are some excerpts from an exposé published by the Washington Post. …the government has spent more than $1 billion trying to replace its antiquated approach to managing immigration with a system of digitized records, online applications and a full suite of nearly 100 electronic forms. A decade in, all that officials have to show for the effort is a single form that’s now available for online applications and a single type of fee that immigrants pay electronically. The 94 other forms can be filed only with paper. Amazing. After 10 years and $1 billion, the net result is a total cluster-you-know-what. …officials at the Department of Homeland Security, which includes USCIS, were aware that the project was riddled with hundreds of critical software and other defects. …Only three of the agency’s scores of immigration forms have been digitized — and two of these were taken offline after they debuted because nearly all of the software and hardware from the original system had to be junked. ..A report last year from the DHS inspector general’s office said it sometimes took up to 150 clicks for employees to navigate the system’s various complex features and open documents. So is the incompetent contractor (IBM) getting punished? Are any of the bureaucrats in charge of the project getting fired? Of course not. This is government! So why you waste some money, that’s merely a prelude to wasting even more money. This project, run by U.S. Citizenship and Immigration Services, was originally supposed to cost a half-billion dollars and be finished in 2013. Instead, it’s now projected to reach up to $3.1 billion and be done nearly four years from now. By the way, the incompetence revealed in this story this is not an argument for immigration or against immigration. My point is simply that governments have long track records of squandering other people’s money, with this story simply being another straw on the camel’s back. Or maybe it would be better to describe it as another bit of dead weight financed by over-burdened taxpayers. I don’t know if this will make anyone feel better, but other governments are similarly incompetent and foolish. Here’s an example of government blundering from overseas. As reported by the UK-based Guardian, the European Commission just admitted that it has successfully process 0.00015 percent of refugees. EU members states agreed in September to relocate 160,000 people in “clear need of international protection” through a scheme set up to relocate Syrian, Eritrean, and Iraqi refugees from the most affected EU states – such as Italy and Greece – to other EU member states. 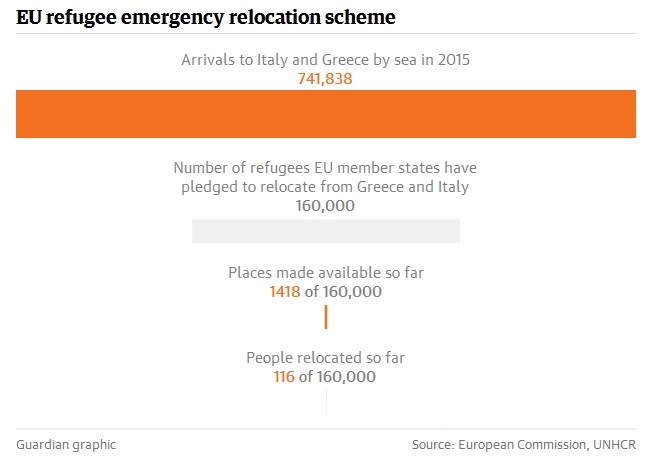 So far 116 people have been relocated, and only 1,418 places have been made available by 14 member states, according to data released on Tuesday by the European Commission. Wow. It’s been a while since I was a student, but I remember that you need 70.0 percent for a C and 60.0 percent to avoid failing. With that in mind, I wonder what sort of grade you get for 0.00015 percent? Is there such as thing as F-, though I guess Z- would be more appropriate. Here’s a graphic from the article. By the way, the EU’s incompetence at processing refugees is one issue. Another issue is whether European nations should be granting refugee status to hundreds of thousands (and eventually millions) of people from cultures that don’t assimilate very well. And I imagine that refugee status in Europe means access to welfare, so the system presumably creates the same perverse incentives we find on the American refugee program. But for today, I’m simply focused on the fact that government bureaucracies are spectacularly incompetent. Yet there are still many people who want to give more power and money to politicians. Let’s close with a serious point. Unless you’re an anarcho-capitalist, there are some things you want government to do, and you want those things to be done well. So how, given the natural incompetence of the public sector, can you get good (or at least acceptable) results? The only feasible answer is to have small government, as Mark Steyn has explained with his usual dose of sarcasm. A bloated public sector guarantees slipshod performance everywhere. But if the federal government concentrates on just a few tasks, oversight and monitoring will be easier and it will be easier to weed out incompetence. And this isn’t just theory. 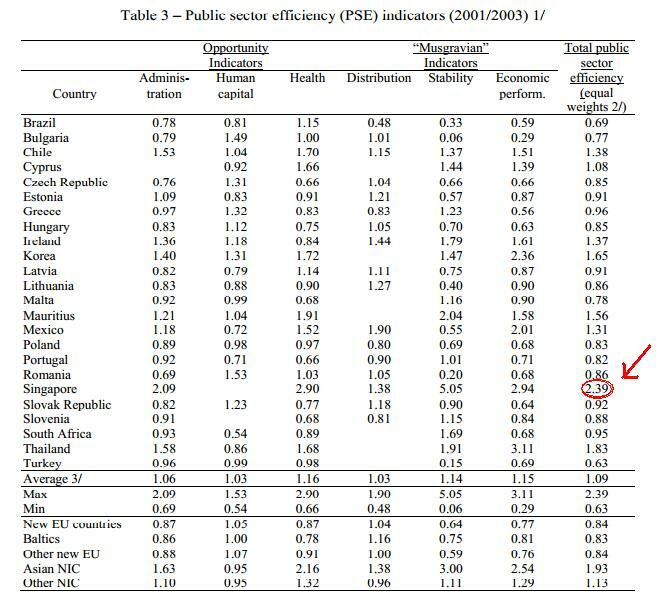 The European Central Bank has produced a measure of public sector efficiency and their research shows that smaller governments are much more competent at producing desired results. P.S. Bizarrely, some folks acknowledge government incompetence but think the right solution is more power for government. P.P.S. Some of this is common sense. What government do you think is more competent and effective, France with its big government or Switzerland with its medium-sized government? Where do you think government is more effective, Singapore with its small government or the United States with its medium-sized government? In most cases, I can understand why immigration is a controversial issue. Take amnesty, for instance. Opponents make reasonable points about the downside of rewarding folks who cut in line while supporters make reasonable points about deportation being harsh and impractical. There’s also a fight relating to welfare, with critics (and not just in America) saying that immigrants are more likely to be poor and a burden on taxpayers and advocates pointing out that it makes more sense to wall off the welfare state rather than walling off the country. The “anchor baby” issue is another emotional topic, with people on both sides of the issue making both legal and practical arguments about whether children born in the United States should automatically become citizens. And then there’s the biggest question of all, which is deciding on the “right” number of immigrants, with answers ranging from none to completely open borders. I get why these topics don’t have answers that are satisfactory to all sides. But there is one immigration controversy that leaves me most puzzled. Why are some people opposed to the “EB-5” program designed to attract rich investors to America? 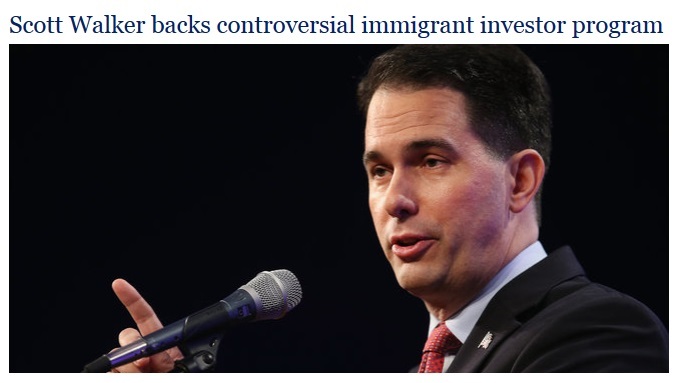 As I noted when defending Governor Scott Walker’s support for the program, this should be a slam-dunk issue. The program attracts people who will create jobs and won’t be a burden on taxpayers. Isn’t that a win-win situation? Apparently not. Check out these excerpts from a hostile column by Kenric Ward in Roll Call. Set to expire by year end, the EB-5 immigration program is up for renewal on Capitol Hill. Can Americans expect the biggest supporters of controversial investor visas to bring them under control? There are ample reasons to scrap the pay-for-play system that has been exposed by numerous government investigations. …Ostensibly, the EB-5 program uses foreign capital to create U.S. jobs. In fact, no one knows how many jobs. No one knows exactly where the money comes from, or where it winds up. Such niggling details don’t matter to lawmakers. They glibly call EB-5 a job-creating tool. That’s their story, and they’re sticking to it. 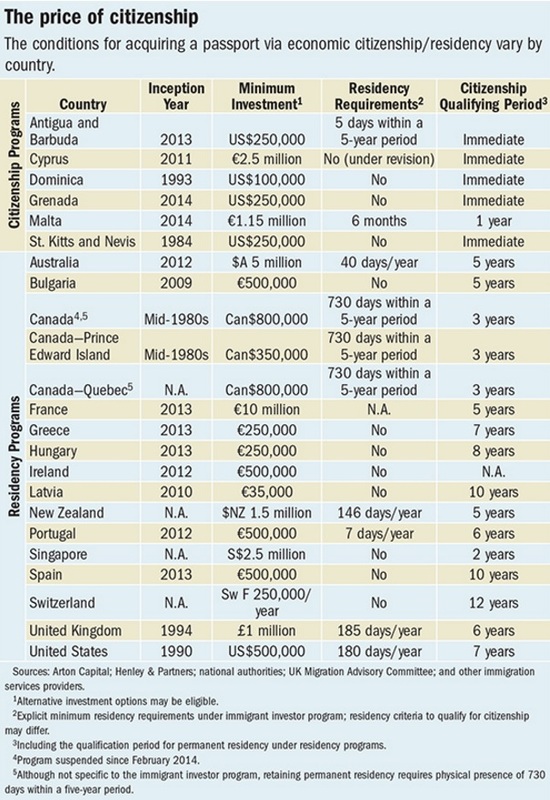 …a visas-for-cash program was ill-conceived and ultimately unenforceable. The American model that uses hundreds of freewheeling middlemen as “job creators” is even more ripe for cronyism and outright fraud. By the way, Mr. Ward makes a very valid point about cronyism. I’ve also criticized this aspect of the program, which almost seems designed to reward politicians and other insiders. But I don’t want to throw the baby out with the bathwater. Other people, however, think the baby is the problem. This Washington Post story basically says the program is unfair because rich people get to come to America. …unions and immigrant advocates are focusing attention this week on a federal visa program that they deride as “Immigration Reform for the 1%.” The target of a series of press conferences in a half-dozen cities is the EB-5 immigrant investor program, which allows foreigners to get green cards by investing at least $500,000 in American businesses, as long as the money creates at least 10 jobs. Created by Congress in 1990 as a way to stimulate the U.S. economy, the program is supported by business groups and has increasingly been used in recent years by real estate developers and other firms seeking foreign investors. …“We have this program that gives a pretty fast track to immigrants from the 1 percent and gives incredible advantages to developers,” said Isaac Ontiveros, a research analyst for UNITE HERE, a union that represents nearly 300,000 hotel, casino and food service workers. He estimated that one-third of businesses funded by EB-5 are hotels or casinos. Though I wonder whether Mr Ontiveros is simply looking to hold up reauthorization of the program in hopes of adding amnesty to the legislation. Ontiveros added: “How does this help the 11 million people in this country who are stuck in immigration reform limbo?” …some critics saying the program doesn’t do enough to benefit targeted poor areas, especially rural ones… Ontiveros said…“We want those in Congress and at the local level to be aware of the inequities of this program,” he said. In any event, I actually agree with Ontiveros that the program is inequitable. But that’s precisely the point. Lawmakers in America are picking and choosing who to let in the country and they’re deciding that it’s better to have successful investors. Now let’s look at the issue from the other side. 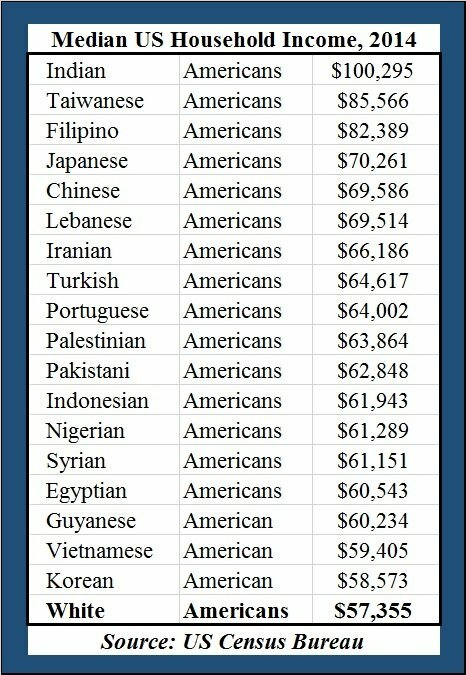 Why do upper-income people from overseas want to become Americans? Well, an article in Quartz explains that they often come from nations that have unpalatable policies and that they want greater long-run stability. The world’s wealthy and super-rich are increasingly on the hunt for second passports as they seek to protect their wealth, optimize their children’s education and move to countries with…greater economic and political stability. A report from New World Wealth reveals the top eight countries that have become popular second citizenship destinations for 264 000 of the world’s millionaires from 2000-2014. …Most countries with large outflows of millionaires have stringent tax regimes, prompting the super-rich to move to countries that are more favourable for their wealth. This chart shows the countries with the greatest number of departing millionaires. I imagine that folks escape France and Italy because of excessive taxation, while they leave the other countries because of a desire to redomicile in places where the quality of life is better and rule of law is stronger. By the way, it’s a good sign when rich people want to come to the United States and a worrisome indicator when they don’t. Indeed, America would attract more really rich people if we didn’t have an onerous worldwide tax system. P.S. 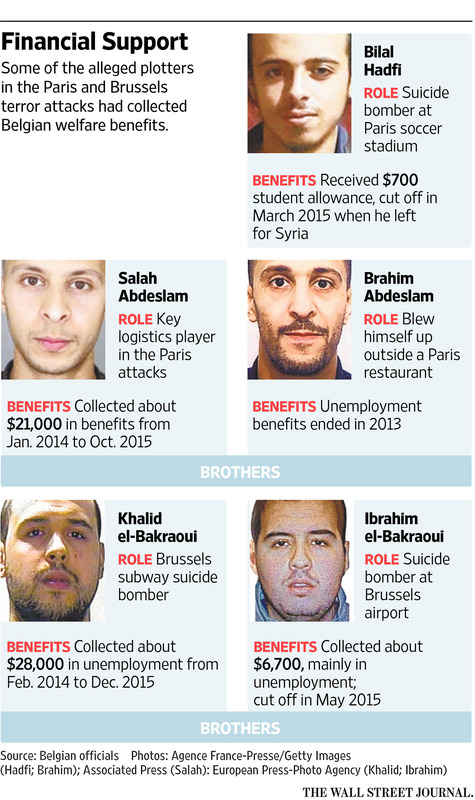 In my humble opinion, the most troubling aspect of our immigration system is the way the refugee program is funding terrorists with welfare checks. P.P.S. To close on a happier note, here some immigration-themed humor, starting with this amusing video about Americans sneaking into Peru and ending with this satirical column about Americans sneaking into Canada.